I slept poorly last night, a combination of a cold that got worse, daytime cold medicine (the ban on pseudophedrine seems to make it impossible to get a decent drowsy medicine), and Rex making a little (not much) noise overnight. At what I thought was 4.30, Rex starts talking, and he needs to get up when it's nearly 5. I'm in slight despair. I think I've slept maybe 4 or 5 hours, and it's an ungodly hour. I pull the first shift with Rex, because he needs to get a dose of prescription acid medication that has to be in his stomach 30 minutes before food. On a good day, I get up, Lynn sleeps for another half hour (and sometimes through Rex's preparatory "singing" and talking), and entertainment him. I get Lynn up, and if it's really early, I go back to sleep for an hour or so. Sometimes she can then put Rex down and go back to sleep herself, although with Rex going longer between naps, that's not happening very often. Lynn takes pity on my state, gets Rex up, and I put in earplugs and go back to sleep for a couple of hours. When I wake up and come out into the living room, I look at the new clock we put up yesterday and figure it's already broken. It reads an hour later than the clock on my bedside. I cogitate about this in the back of my head for a few minutes, and then remember: my clock, a Timex brand made under license by another firm, handles daylight saving time. But not the current DST. 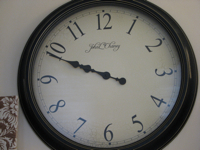 It handles the DST before Congress changed the rules, which went into effect last year. So twice a year for about two weeks from now on, my clock has the wrong time. I contacted Timex last year, which handed me off to their licensing partner--how nice to know that Timex doesn't really mean Timex--who said that there was no way to upgrade the clock, which I figured. I like the clock. But now its time is out of joint forever. Rex woke up at 5.30, got up at nearly 6, which is pretty good for him. I slept an hour more than I thought I had. I was (and am) still sick, though.